Eight years earlier the talented fiddler, Elsbeth Weaver, gave up the man she loved to care for her ailing grandfather. Now, she must risk her life to save her grandfather from a lynching by playing for the wyvern terrorizing the countryside. When she comes face-to-face with the beast at the haunted cliffs of Maldoza, she is both frightened and fascinated. Something about the creature reminds her of the bard who once stole her heart, something more than just a shared name. Alaric has never stopped loving the human woman he left behind in a dusty village almost a decade before. When he meets her again at Maldoza, wearing old dragon armor and playing her fiddle as if her heart would break, he is overjoyed. 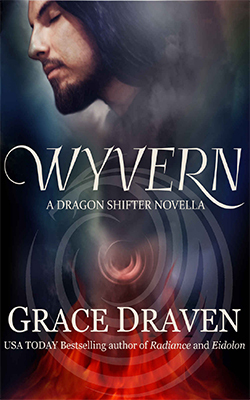 Elsbeth doesn’t know her erstwhile lover is only an illusion for the wyvern, and Alaric must convince her that the heart of the beast is no less devoted than the heart of the man.